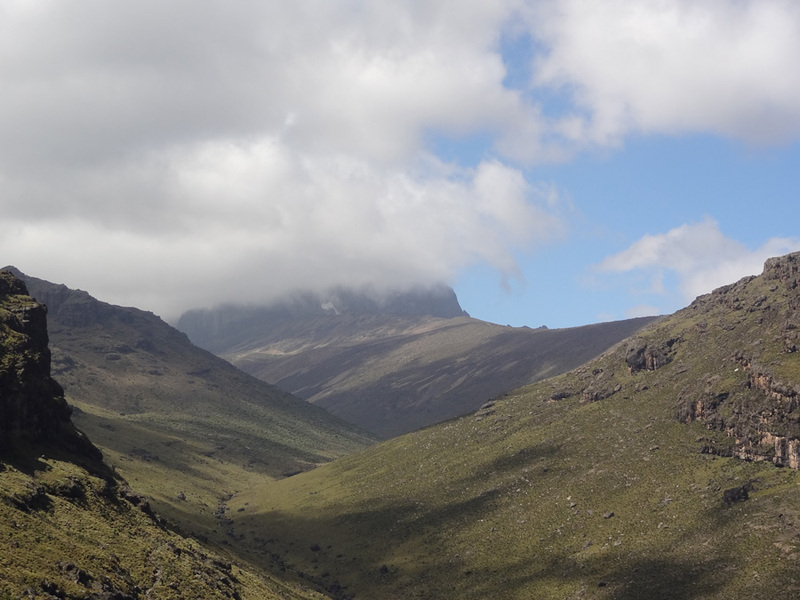 At Old Moses we encountered a group of four English women who had been to Point Lenana – Mount Kenya’s 3rd highest peak, the day before. It was a perfect opportunity to make friends, engage in idle chitchat and get pointers on what to expect over the next three days. They assured us that it would be a pleasant experience and that did help as we traipsed around the mountain taking selfies and marveling at the scenery. A mixture of anticipation and the early onset of altitude sickness had all of us a bit giddy and sleep was kept at bay for the better part of the night. Cold icy winds billowing down from the mountain peak was what roused us from slumber and ushered in our second day up Mount Kenya. The days trek would take us through a windy 7 hour, 14 km hike through jaw dropping scenery of the Mackinder’s valley to Shipton camp. We traversed through the crystal clear mountain streams, vertical bogs that took everything from you and along the enchanting valley with imposing peaks on both sides that cast the whole landscape in an extraterrestrial light. We reached Shipton’s camp later in the afternoon and to our amazement we were met with snowfall, a pleasantly surreal experience considering the fact that we were straddling the equator. The night temperatures were almost freezing and the icy gush made sleep untenable. John came to wake us up at 2 a.m.; we had to get going in half an hour if we were to make any hope of watching the sunrise from the peaks realistic. We grunted and plodded our way up the vertical slopes in peach black darkness for what seemed like an eternity. None in our party was in the cheery mood of the days past; this is when the realization that no one conquers the mountain begun to earnestly sink. In the absence of the beautiful scenery to distract us from the psychological and physical tribulations of climbing a mountain, all one could focus on was putting one foot in front of another. It made us really understand the notion of here and now; a simple lesson that was conferred to us with raw brutishness. After four hours the peaks were in sight, illuminated by the tiny sliver of pink light that was starting to show from a crack in the horizon towards the orient. We finally made it up to Point Lenana and the scene that we met at the roof of Kenya was one of breathtaking beauty and utter awesomeness. Mount Kenya was towering above puffy white clouds that seemed to look like immaculate petals lying at the feet of this behemoth. The sun’s rays were by now tenderly kissing the craggy cliff of Mt. 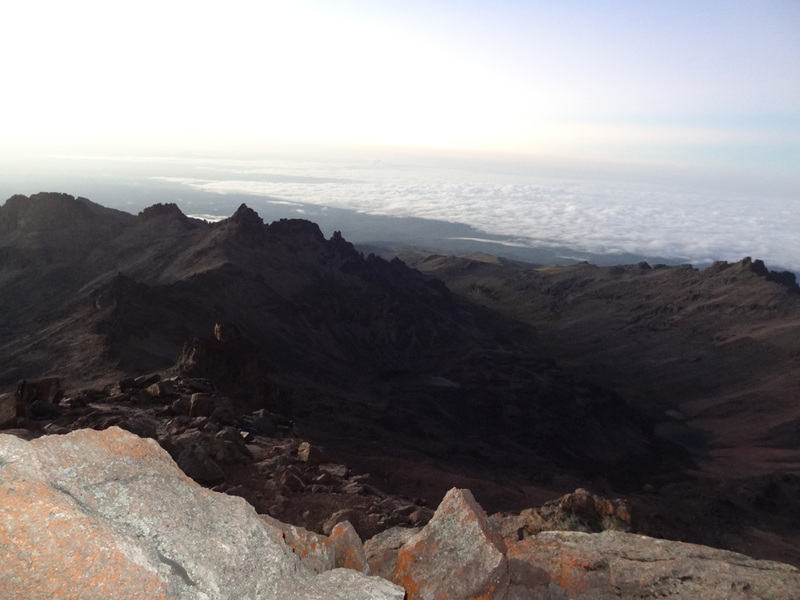 Kenya’s highest peaks, Nelion and Batian, washing them in an incandescent golden glow. This was a beautiful contrast to the massive white glacier below. We spent a few more minutes taking in the view and stocking up on our social footage, mentally preparing ourselves for the 9 hours hike around the summit circle. After a few more minutes of taking photos we begun our descent on the southern slope of the mountain. It was a treacherous walk on account of the moraine and the frozen ground, its razor sharp that tore into our hiking boots. The high altitude and thin air did little to make the walk any less punishing. 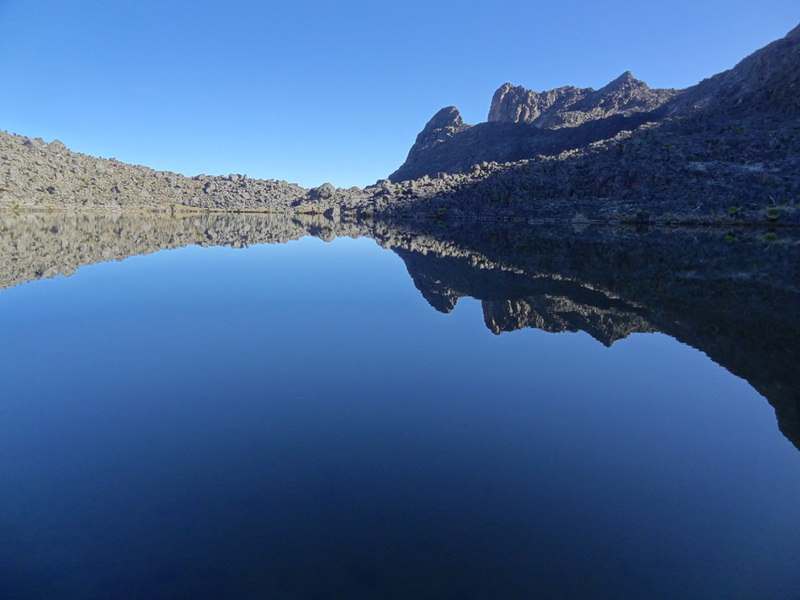 We traversed the summit circle, passing placid tarns with their still waters and just over Clear Mountain streams with water so clean we drunk straight from them. The last leg of the walk was a 3 km vertical climb on a steep slope that had loose soil which made it almost impossible. After what seemed like innumerable rest stops and an unending walk, we could see Shipton’s Camp calling to us. It was a beacon that signified the start of our last night on the mountain. 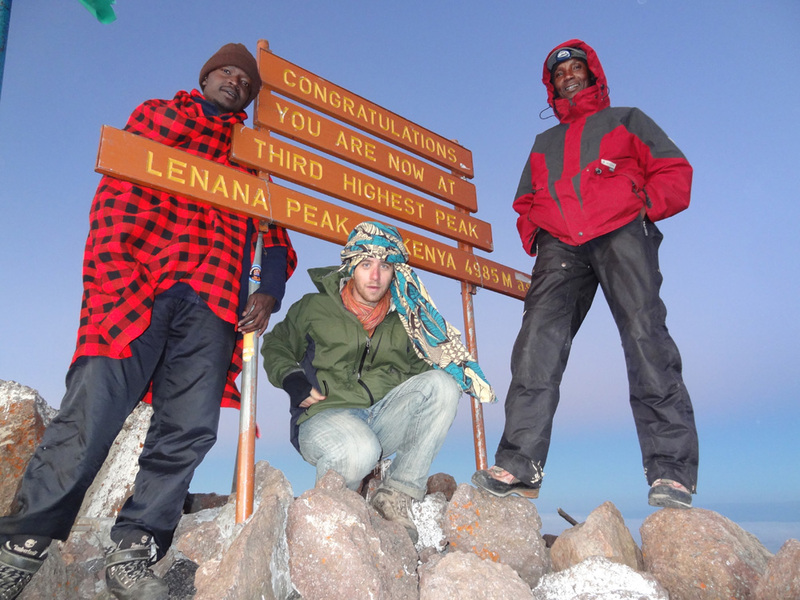 We were hungry and exhausted but our spirits were kept up with the realization that we had reached the peak. The mountain had chewed us, swallowed us, then spat us out different men from the ones who had embarked on this journey 5 days earlier. Sleep came quickly and it was eagerly welcomed by all of us. 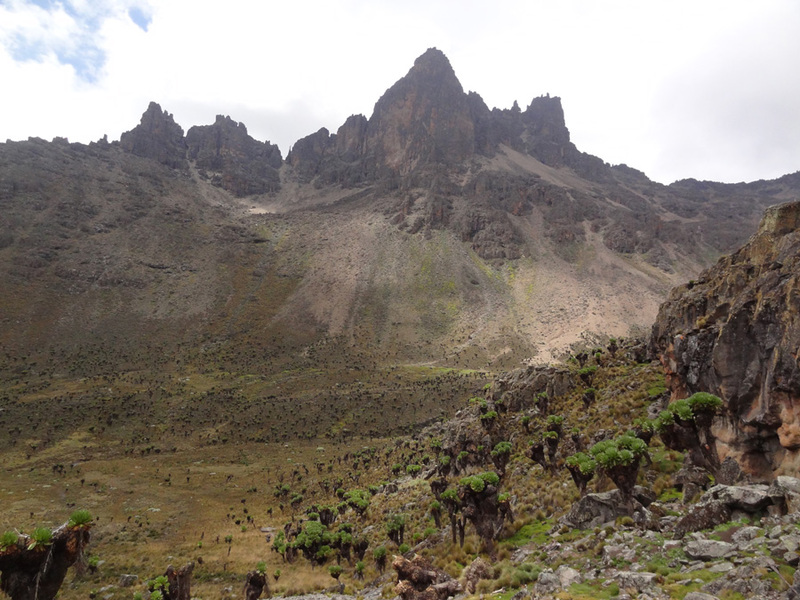 We had had our time with Mount Kenya and like all good things; our experience was drawing to its inevitable end. The morning found us well rested and itching for the hike down Chogoria, which we were informed was the most scenic of all the mountain routes. 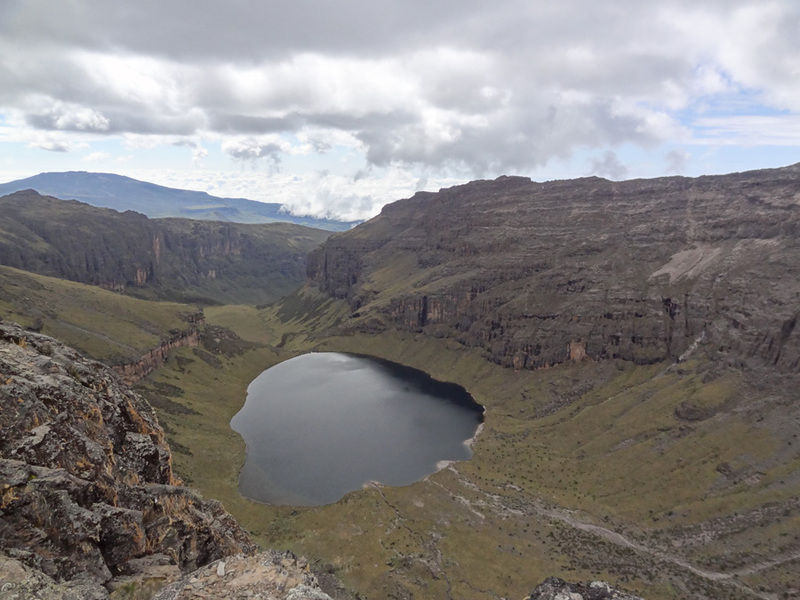 It was a 7-hour; 30 km trek through an outer worldly landscape that was made entirely of unimaginable beauty. Due to the high altitude we got the chance to walk among the clouds and marvel at lake Ellis, Mt. Ithanguni and the Vivienne falls. The temple, which looks down sheer cliffs 200 meters down on to the magnificent Gorges Valley and on to beautiful lake Michaelson. As we got closer to the rainforest we were met by a downpour that persisted until we reached the Chogoria gate where our driver was waiting for us. Would you like to share your travel story? Visit this page to submit your Kenya travel story.